DePaul has put together a short animated video (The Name Above The Door) on DePaul University's Mission. The video discusses the name above the door and what it means to be Vincentian, and the question "What must be done?" 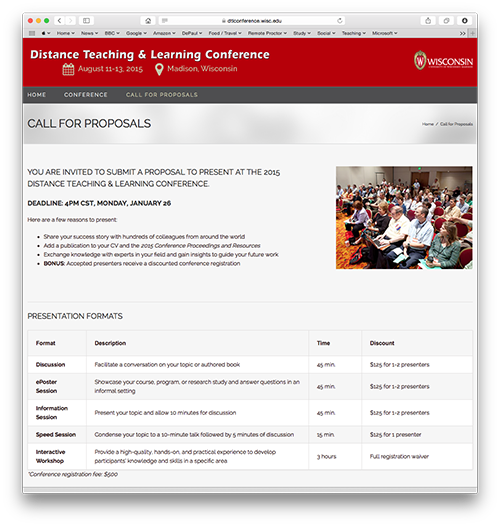 The Call for Proposals is now open for the Distance Teaching & Learning Conference that takes place Madison, Wisconsin from August 11-13, 2015. The Distance Teaching & Learning Conference welcomes hundreds of distance education and online learning professionals every year to share effective practices, research, strategies, and new tools/techniques.